Update #2: So, apparently The Swerve has won the 43rd Annual James Russell Lowell Prize from the MLA. No time to write now, but this is frustrating and disappointing. Update #1: The conversation is ongoing. See here for my follow-up post. My contributions to this blog have been virtually and unsurprisingly nonexistent since the start of the semester and of the job market season. But, after engaging in some mutual twitter shaming with other bloggers about "Why don't we blog more?! ", I resolved to put something up soon. Then, as if the Fates heard my twitter-whinging, I read two pieces in the last two days that I think readers of this blog should absolutely check out. So, humbly accept this "Briefly Noted" post as a prelude to more writing. Soon. 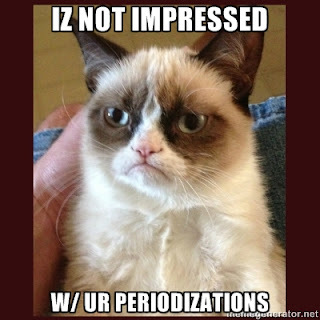 The first piece that caught my attention is Jeffrey Cohen's draft of a position paper on periodization. The second is a thorough take-down of Stephen Greenblatt's The Swerve, which would be the best critical take-down I've read this year if it weren't for this gem. Both of these pieces engage with the well-trod problem of how we conceptualize the relationship of the Middle Ages to the Early Modern Period. Or, to put it more bluntly, they critique the notion that the Renaissance or the Early Modern represents some fundamental break with its past, and that this break constitutes the beginning of the Modern World, or, Everything That Is Good. I have to admit to being surprised by both of these because I did not think there was much to add to the conversation. I was wrong. Medievalists learned long ago that when you carve your scholarly habitation out of time’s wilderness of flux and declare this secure home exclusively yours, you may as well have retreated to the monastery. Or if instead of attempting to live apart from modernity you enter its conversations by insisting that "All your base are belong to us" (or AYBABTU, as the kids write) -- that it all started c. 750 or 1200 or 1500 or whatever -- you will be the person in the corner attempting to be cool by citing old internet memes while really just give those nearby an excuse to step quietly away. If Greenblatt remained one of the “tenured radicals” he once was accused of being (by no less a scold than George Will), The Swerve might have told readers that notions such as the Middle Ages and the Renaissance are little better than shorthand for arbitrarily bracketed periods of time in which certain changes in the pattern of human life are interpreted as significant and others are not. It might have enumerated the costs of so-called modernity, and the continuities from the past that sustain it, alongside the justifiably celebrated developments. It might have noted that many of the supposed religious values scorned by Lucretius — faith, self-sacrifice, an identity shaped not by individual desire but by family and community — remain widespread in western and non-western cultures and are in no way inimical to human freedom and progress. A truly radical book might have left readers feeling more challenged by the past, less quick to pass judgment and more able to find value in ways of life alien to their own. The past is not past, is not an absolute difference; nor is the past conjoined to the present in continuity, in sameness. Past, present, and future are a temporal knot, thick with possibility even while impossible to fully untangle. Time is irregular, history is queer. Jim Hinch ends his piece with an idea from a former professor of his, that the best history would be a "history completely without transition." I can think of worse things. Let's take a look at modernity. Isn't it often identified with urban life of a certain lively sort? Of, say, being able to walk down a city street with a few coins in your pocket and buy some fast food at a fast food outlet? But we know that in the time of Hammurabi in the city of Ur, they had fast food outlets. Ditto for Pompeii when Vesuvius blew up. (I admit they didn't have coins in Ur.) Is Pompeii in the first century A.D. or Ur in the second millennium BC a modern venue? Could be that modernity is not temporal at all, but a certain intellectual and social atmosphere that exists in many times and places, not necessarily continuous with each other. Great post! You sum up well what I often have trouble describing to undergrads in discussions of periodization. Rick, thanks for pointing out these two posts in this way. I had read both of them over the past two days, but it's great to see them put into conversation with each other. It's amazing that we still continue to have these conversations, still continue to push against these (as you say) well-trodden problems, and that we (and I'm sure I'm complicit in this, too) still impose so much upon history. Steve, I like your idea about "a certain intellectual and social atmosphere that exists in many times and places," yet I wonder about using the term "modernity" for it. I'm afraid that still runs the risk of affirming a teleological view of history, not only up to the present, but that civilizations always develop toward the better, or toward their own manifestations of "modernity." I think this is too often the view of history: a great civilization rises, reaches its pinnacle, then tumbles for some reason--often because the next big civilization comes along. But it's never really that simple, is it? There is always development, but not necessarily positive or negative. In thinking about history, we need to learn to embrace the idea of difference. "There is always development, but not necessarily positive or negative. In thinking about history, we need to learn to embrace the idea of difference." I like this. We should always push back against teleological, evolutionary (in the sense of progressivist) history.